What if the May 1921 superstorm occurred today? 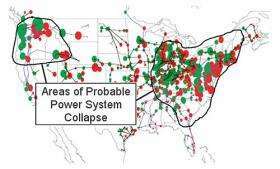 A US map of vulnerable transformers with areas of probable system collapse encircled. A state-by-state map of transformer vulnerability is also available: click here. Credit: National Academy of Sciences. Did you know a solar flare can make your toilet stop working? That's the surprising conclusion of a NASA-funded study by the National Academy of Sciences entitled Severe Space Weather Events—Understanding Societal and Economic Impacts. In the 132-page report, experts detailed what might happen to our modern, high-tech society in the event of a "super solar flare" followed by an extreme geomagnetic storm. They found that almost nothing is immune from space weather—not even the water in your bathroom. The problem begins with the electric power grid. "Electric power is modern society's cornerstone technology on which virtually all other infrastructures and services depend," the report notes. Yet it is particularly vulnerable to bad space weather. Ground currents induced during geomagnetic storms can actually melt the copper windings of transformers at the heart of many power distribution systems. Sprawling power lines act like antennas, picking up the currents and spreading the problem over a wide area. 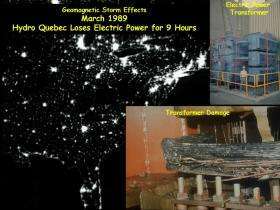 The most famous geomagnetic power outage happened during a space storm in March 1989 when six million people in Quebec lost power for 9 hours (see image below). According to the report, power grids may be more vulnerable than ever. The problem is interconnectedness. In recent years, utilities have joined grids together to allow long-distance transmission of low-cost power to areas of sudden demand. On a hot summer day in California, for instance, people in Los Angeles might be running their air conditioners on power routed from Oregon. It makes economic sense—but not necessarily geomagnetic sense. Interconnectedness makes the system susceptible to wide-ranging "cascade failures." To estimate the scale of such a failure, report co-author John Kappenmann of the Metatech Corporation looked at the great geomagnetic storm of May 1921, which produced ground currents as much as ten times stronger than the 1989 Quebec storm, and modeled its effect on the modern power grid. He found more than 350 transformers at risk of permanent damage and 130 million people without power. The loss of electricity would ripple across the social infrastructure with "water distribution affected within several hours; perishable foods and medications lost in 12-24 hours; loss of heating/air conditioning, sewage disposal, phone service, fuel re-supply and so on." "The concept of interdependency," the report notes, "is evident in the unavailability of water due to long-term outage of electric power--and the inability to restart an electric generator without water on site." The strongest geomagnetic storm on record is the Carrington Event of August-September 1859, named after British astronomer Richard Carrington who witnessed the instigating solar flare with his unaided eye while he was projecting an image of the sun on a white screen. Geomagnetic activity triggered by the explosion electrified telegraph lines, shocking technicians and setting their telegraph papers on fire; Northern Lights spread as far south as Cuba and Hawaii; auroras over the Rocky Mountains were so bright, the glow woke campers who began preparing breakfast because they thought it was morning. Best estimates rank the Carrington Event as 50% or more stronger than the superstorm of May 1921. 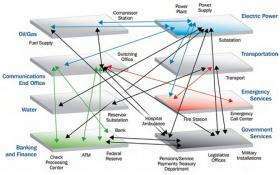 A web of interdependencies makes the modern economy especially sensitive to solar storms. Source: Dept. of Homeland Security. "A contemporary repetition of the Carrington Event would cause … extensive social and economic disruptions," the report warns. Power outages would be accompanied by radio blackouts and satellite malfunctions; telecommunications, GPS navigation, banking and finance, and transportation would all be affected. Some problems would correct themselves with the fading of the storm: radio and GPS transmissions could come back online fairly quickly. Other problems would be lasting: a burnt-out multi-ton transformer, for instance, can take weeks or months to repair. The total economic impact in the first year alone could reach $2 trillion, some 20 times greater than the costs of a Hurricane Katrina or, to use a timelier example, a few TARPs. What's the solution? The report ends with a call for infrastructure designed to better withstand geomagnetic disturbances, improved GPS codes and frequencies, and improvements in space weather forecasting. Reliable forecasting is key. If utility and satellite operators know a storm is coming, they can take measures to reduce damage—e.g., disconnecting wires, shielding vulnerable electronics, powering down critical hardware. A few hours without power is better than a few weeks. NASA has deployed a fleet of spacecraft to study the sun and its eruptions. The Solar and Heliospheric Observatory (SOHO), the twin STEREO probes, ACE, Wind and others are on duty 24/7. NASA physicists use data from these missions to understand the underlying physics of flares and geomagnetic storms; personnel at NOAA's Space Weather Prediction Center use the findings, in turn, to hone their forecasts. At the moment, no one knows when the next super solar storm will erupt. It could be 100 years away or just 100 days. It's something to think about the next time you flush.